For many years, British service personnel have been treated with a controversial anti-malaria drug despite warnings issued by its manufacturer. The Commons defence select committee, of which I am a member, has heard from scientists, lawyers and servicemen to try to understand why. … our military handed them out like confetti; issued them with rations and bullets from the stores. Countless personnel have been affected, leading to years of trauma and, for some, even forced confinement in secure mental health units. Johnny Mercer, The Ministry of Defence has betrayed our armed forces’ mental health, The Times, 24 May 2016. Dylan Welch, Australian veterans renew call for Defence to acknowledge side effects of Larium, ABC 7.30 Report, 10 June 2016. Ross Eastgate, Fight for justice on malaria drug, Townsville Bulletin, 26 May 2016. Henry Belot, Australian veterans welcome British report on controversial drug mefloquine, Sydney Morning Herald, 25 May 2016. Henry Belot, Therapeutic Goods Administration warned military doctors before using experimental drug on soldiers, Canberra Times, 29 April 2016. Caleb Cluff, Malarial drug the focus of concern, The Ballarat Courier, 25 April 2016. Henry Belot, Senators demand further explanation from Australian Defence Force over antimalarial drug mefloquine, Sydney Morning Herald, 20 March 2016. Rachel Riley, Defence urged to warn of drug risk, Townsville Bulletin, 18 March 2016. Henry Belot, Defence Minister Marise Payne under pressure to release mefloquine investigation, Sydney Morning Herald, 16 March 2016. Channel Seven Television, Trial outrage, Local News Townsville, 14 March 2016. Rachel Riley, Families call for answers, Townsville Bulletin, 14 March 2016. Jesse Dorsett, Former soldiers, families face military officials in Townsville over anti-malaria drug side effects, ABC News, 14 March 2016. Lydia Kellner, Top medic says ADF has ‘nothing to hide’ over controversial drug trials, Townsville Bulletin, 12 March 2016. Ross Eastgate, A soldier’s lost war, Townsville Bulletin, 29 February 2016. Lydia Kellner, Side effects of two drugs used during defence trials to be discussed at national health seminar, Townsville Bulletin, 19 February 2016. Henry Belot, Senior ADF officials defend use of antimalarial mefloquine to Senate hearing, Sydney Morning Herald, 11 February 2016. Editorial, It’s time defence committed to public inquiry into malaria drug, Brisbane Times, 27 December 2015. Henry Belot, Labor threatens Senate inquiry into Australian Defence Force’s use of antimalarial drug mefloquine, Canberra Times, 23 December 2015. Paul Cleary, War veterans’ antimalarial drugs damage claims backed by Defence committee, The Australian, 23 December 2015. Henry Belot, ‘Mad house of emotions’: Defence documents reveal long-held concerns about drug linked to depression, anxiety, nightmares, Sydney Morning Herald, 23 December 2015. Peter Lloyd, ADF should have known dangers of anti-malarial drug before testing on personnel: expert, ABC PM, 18 December 2015. Peter Lloyd, RSL supports soldiers suffering potential side effects from anti-malarial drug, ABC PM, 17 December 2015. Peter Lloyd, Calls for inquiry into army use of Malaria drug, ABC PM, 16 December 2015. Rebecca Trigger, WA former soldier fears anti-malarial Army drug trial caused permanent brain injury, ABC News, 11 December 2015. Rebecca Trigger, Growing call for judicial inquiry as soldiers in anti-malaria drug trial hit ‘brick wall’, ABC News, 11 December 2015. Adam Davies, Defence force admits Mefloquine use has side-effects, Queensland Times, 7 December 2015. Alexandra Back and Henry Belot, Australian Defence Force defends use of anti-malarial drug mefloquine, Sydney Morning Herald, 4 December 2015. Mandie Sami, Australian Defence Force accused of ‘massive cover-up’ over anti-malarial drug, ABC The World Today, 4 December 2015. Jennifer Russell, Army major calls for independent inquiry into anti-malarial drug linked to depression, anxiety and nightmares, Daily Mail, 30 November 2015. Henry Belot, Soldiers fear drug program has scarred them with depression, anxiety, nightmares, Canberra Times, 30 November 2015. Editorial, Defence should heed calls for public inquiry into drug used to prevent malaria, The Canberra Times, 30 November 2015. Paul Cleary, What do Defence’s 140 media staff actually do?, The Australian, 8 November 2015. Adam Davies, Mefloquine expert says it should be banned from military use, Queensland Times, 17 October 2015. Adam Davies, Doctor says army should be ashamed for drug testing, Queensland Times, 17 October 2015. 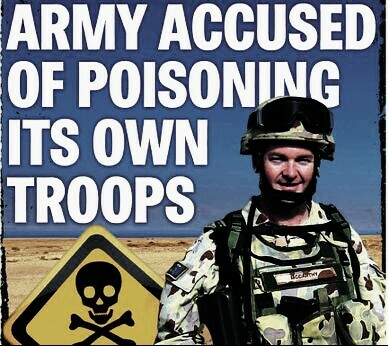 Adam Davies, Army used Ipswich soldier as guinea pig in drug trial, Queensland Times, 17 October 2015. Paul Cleary, Drug trial a test of ethics, The Australian, 11 September 2015. Paul Cleary, ADF accused of being ‘unethical’ in drug trial on troops, The Australian, 24 August 2015. Sophie Black, Questions remain over anti-malaria drug Lariam, Crikey.com, 28 June 2006. Bianca Nogrady, Mefloquine psychosis link downplayed, Australian Doctor, 23 February 2005. Brendan Nicholson, Army braces for suit on malaria drug, The Age, 25 October 2004. Staff, Defence confirms drug made soldiers sick, ABC News, 24 October 2004. AAP, Only five adverse effects reported: Defence, The Age, 24 October 2004. CTV News Saskatoon, Veteran experiences malaria drug’s side effects, Canadian Television, 25 Jun 2016. Lynn Desjardins, Canadian troops still taking malaria drug British call risky, Radio Canada International, 26 May 2016. Editorial, Stop giving soldiers anti-malaria drug mefloquine, Toronto Star, 26 May 2016. Sheila Pratt, Risky anti-malaria drug given to thousands of Canadian veterans, Toronto Star, 25 May 2016. Jonathan Charlton, Veteran finds new hope after years of mental suffering, Saskatoon Star Phoenix, 24 May 2016. Sheila Pratt, Edmonton woman suffers poisoning from anti-malarial drug mefloquine during travels in Africa, Ottawa Citizen, 12 February 2016. Sheila Pratt, Stop pretending mefloquine was used safely on soldiers: former top Canadian drug bureaucrat, Ottawa Citizen, 7 February 2016. Sheila Pratt, Veterans anxious to hear from Hehr on mefloquine issue, Ottawa Citizen, 1 February 2016. Sheila Pratt, New push for ban on mefloquine in the Canadian military, Ottawa Citizen, 29 January 2016. Sheila Pratt, Life after Somalia: Kyle Brown, PTSD and the past, Ottawa Citizen, 29 January 2016. Peter O’Neil, Opposition MPs demand government act on dangerous anti-malaria drug, Vancouver Sun, 28 January 2016. Peter O’Neil, B.C. military veteran calls for federal apology for controversial anti-malaria drug, Vancouver Sun, 27 January 2016. Grant Lafleche, Put an end to mefloquine, The Standard, 24 December 2014. Grant Lafleche, The Meflomares: Controversial drug still given to Canadian soldiers, Toronto Sun, 23 December 2014. Associated Press, FDA warning on antimalaria drug might be cited in Afghan slayings case, GlobalNews.ca, 31 July 2013. Dave Lazzarino, The Canadian Airborne Regiment’s Somali Affair, 20 years later, The Edmonton Sun, 15 March 2013. Nancy Wood, Malaria drug for Canadian troops called dangerous, CBC News, 11 April 2012. Staff Reporter, Somalia-affair charges dropped, The Ottawa Citizen,16 September 2008. Peter Worthington, Did we poison our Somalia soldiers?, The Edmonton Sun, 3 January 1998. Staff Reporter, Group calls for ban on controversial malaria drug used in Army, RTE News, 12 November 2015. Mark Tighe, First pay-out over drug blamed for soliders’ suicides, The Times, 14 October 2015. Shane Phelan, Anti-malarial drug to be withdrawn from Irish market, Independent.ie, 13 October 2015. Michael O’Regan, Concerns raised about soldiers taking Lariam, The Irish Times, 9 October 2015. Shane Phelan, Expert says former soldier’s suicidal thoughts linked to antimalarial drug, Independent.ie, 16 April 2015. Shane Phelan, Army personnel to use Lariam in Ebola mission, Independent.ie, 21 January 2015. Shane Phelan, Defence legal billC will hit €5m as Lariam cases begin to mount, Independent.ie, 21 August 2014. Tim O’Brien, Kenny defends use of anti-malaria drug Lariam despite concerns, Irish Times, 14 June 2014. David Ralph, Lariam: Why is drug linked to suicide still being given to soldiers?, Irish Examiner, 30 January 2014. Mark Tighe, Army’s Lariam expert funded by drug-maker, The Sunday Times, 27 October 2013. Finally Garland, Report on controversial anti-malarial drug to remain secret, The Irish Times, 16 October 2013. Sinead O’Carroll, Horror movie in a pill: Side-effects of Lariam worse than malaria, TheJournal.ie, 7 March 2013. Sima Kotecha, Lariam should be drug of last resort for troops, MPs say, Today, BBC, 24 May 2016. Richard Norton-Taylor, MPs sound alarm over British troops’ use of malaria drug Lariam, The Guardian, 24 May 2016. Alistair Bunkall, MoD could face civil cases over malaria drug use, Sky News, 24 May 2016. Gavin Cordon, Ministry of Defence slammed for issuing anti-malaria drug to troops despite side effects, Daily Mirror, 24 May 2016. Catherine Philp, Soldiers to sue MoD for ignoring malaria drug fears, The Times, 24 May 2016. Kim Sengupta, MoD ‘ignored warnings from manufacturer’ over Lariam, The Independent, 23 May 2016. Kim Sengupta, British armed forces set to ban most prescriptions of controversial anti-malarial drug Lariam, The Independent, 22 May 2016. Tom Batchelor, MoD accused of ‘negligence on a grand scale’ as troops sue over controversial malaria drug, Daily Express, 12 May 2016. Staff Reporter, Ex-soldier from Ely among group taking legal action against MoD over use of anti-malaria drug Lariam, Ely News, 12 May 2016. Jonathan Owen, Lariam: Medical experts condemn MoD for giving soldiers anti-malarial drug with psychiatric side effects, The Independent, 9 December 2015. Sarah Waddington, Plymouth MP Johnny Mercer steps up his fight to ban anti-malaria drug, Plymouth Herald, 8 December 2015. 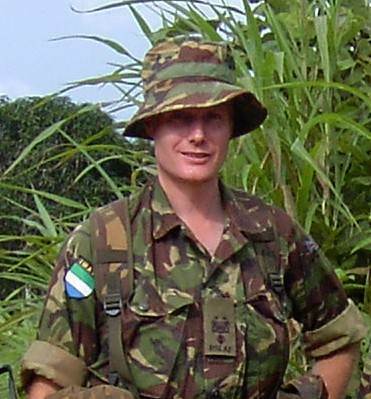 Frances Hardy, Has this highly decorated hero been driven mentally ill by an anti-malaria drug tourists are still given?, Daily Mail, 23 November 2015. Larisa Brown, Malaria pill for forces is a risk, admit drug chiefs: Controversial treatment found to increase risk of depression, anxiety and psychosis, Daily Mail, 11 November 2015. Jonathan Owen, Lariam: Inquiry to be held into MoD’s use of anti-malaria drug on British soldiers amid health concerns, The Independent, 15 October 2015. Sima Kotecha, Answers sought over Army’s use of malaria drug mefloquine, BBC Today, 9 September 2015. Marco Gianangelli, Thousands to sue MoD over anti-malaria drug, Sunday Express, 6 September 2015. Jonathan Owen, Lariam: MoD should stop giving soldiers drug which can induce psychosis, says MP, The Independent, 18 August 2015. Elle Griffiths, Calls to ban anti-malaria drug given to British soldiers over fears it’s linked to depression and mental illness, The Mirror, 17 August 2015. Aisha Gani, Antimalarial drug Lariam should not be given to UK troops, Tory MP says, The Guardian, 17 August 2015. Jonathan Owen, British soldiers sent to Afghanistan given anti-malaria drug known to be dangerous for mental health, Belfast Telegraph, 16 April 2015. Corey Charlton, Almost 1,000 members of Armed Forces require psychiatric treatment after being given anti-Malaria drug linked to mental health problems, Daily Mail, 16 April 2015. Kunal Duta, Labour vows review after 994 troops ‘stricken by Lariam’, Channel 4 News, 16 April 2015. Charlotte Cross, MoD Accused Of Taking Risks With Malaria Drug, Forces TV, 16 April 2015. Marco Giannangeli, Wife blames army drugs for husband’s suicide, The Express, 3 August 2014. Oliver Wright, Revealed: Big Pharma’s hidden links to NHS policy, with senior MPs saying medical industry uses ‘wealth to influence government’, The Independent, 12 February 2014. Press Association, NHS hires drugmaker-funded lobbyist, The Guardian, 11 February 2014. Jonathan Owen, ‘He told me of his Lariam dreams – then killed himself’: The human cost of the UK’s suicide drug scandal, The Independent, 7 October 2013. Press Association, Soldiers at risk from anti-malarial drug, claims ex-senior medical officer, The Guardian, 27 September 2013. Mark Honigsbaum, ‘It’s not a benign drug – it has ruined my life’, The Guardian, 25 October 2002. Paul Harris, British troops risk brain damage from malaria pill, The Observer, 11 September 2000. Spencer Ackerman, US bid for secret Guantánamo force-feeding hearings prompts cover-up fears, The Guardian, 30 September 2014. Wyatt Andrews, Sarah Fitzpatrick, Some U.S. troops haunted by anti-malaria drug’s drastic side effects, CBS News, 23 December 2013. Remington Nevin, Mefloquine: The Military’s Suicide Pill, Huffington Post, 25 November 2013. Elspeth Cameron Ritchie, SGT Scapegoat? The Latest on Lariam and the Sergeant, Time Magazine, 22 July 2013. Elspeth Cameron Ritchie, A Smoking Pillbox: Evidence that Sgt. Bales May Have Been on Lariam, Time Magazine, 20 June 2013. Associated Press, Army units ordered to stop taking anti-malarial drug linked to brain damage, Fox News, 19 September 2013. David Stuart MacLean, Crazy Pills, New York Times, 7 August 2013. Alan Zarembo, FDA warns about anti-malaria drug, Los Angeles Times, 2 August 2013. Maggie Fox, FDA strengthens warnings on malaria drug, NBC News, 29 July 2013. Kelly Kennedy, Army scales back use of anti-malaria drug: Concerns centered on soldiers with brain injury, anxiety, Army Times, 24 May 2009. Dan Olmsted, Military drops toxic-drug diagnosis, United Press International, 9 February 2005. Dan Olmsted, Army suicide rate in Iraq plummets, United Press International, 28 January 2005. Mark Benjamin and Dan Olmsted, Malaria drug links elite soldier suicides, United Press International, 7 September 2004. Mark Benjamin and Dan Olmsted, Army surrenders to ‘coward’ GI, United Press International, 16 July 2004. Associated Press, Hallucinations linked to drug given to troops, NBC News , 14 February 2005. UPI, VA Warns Doctors About Lariam, Military.com, 25 June 2004. Maria Fleet and Jonathan Mann, Military’s use of malaria drug in question: Pentagon studies Lariam’s side effects after soldiers’ suicides, CNN, 21 May 2004. Mark Benjanin and Dan Olmsted, UPI Investigates: Lariam and suicide, UPI, 21 May 2002. Great to see this consolidated effort to fight issuing the anti-malaria drug mefloquine (Lariam) to any serving military or unaware citizen travellers. There are equally effective alternative drugs that can be issued to people travelling in malaria-infested areas. Thankyou! This is just a start. Much more to come. Watch this space!